Heat a little olive oil in a saucepan over a low heat. Add the curry powder and cook for a minute or two, then add the scallions and ginger and cook for a further minute. 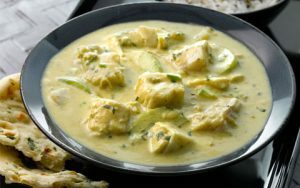 Pour in the coconut milk, stock or water, and bring to a gentle simmer and leave to cook for five minutes. Don’t allow it to boil. Add the fish and cucumber and continue to simmer gently for 3-4 minutes. Add the chopped coriander and season to taste. Serve with rice and naan bread. Tip A little Furikake Japanese seasoning sprinkled over the rice is delicious if you can get it.